I love these cute toothpicks from just the little things. For the how-to and more inspiration, click here. wow! those are the the most chic toothpicks i've ever seen! 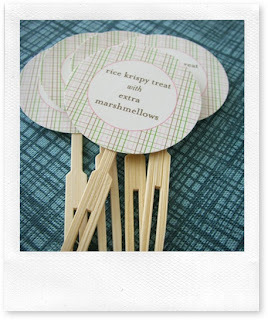 i used to make mini toothpick signs for appetizers out of cheap party toothpicks and sticky labels. i thought they were so cool! these made me realize that i apparently a have a lot to learn about toothpick labeling. Very cute. Congratulations on your Cookie magazine mention. I got mine today and recognized the book you did right away! Thanks, Girlfrog. I haven't yet gotten the issue- I hope it turned out cute! What's up, cool online site you've gotten there.